A 1960s Montana family burns to the ground in Paul Dano’s masterful directorial debut. Dano is best known as an actor (“There Will Be Blood”, “Little Miss Sunshine”) with an innocent face that juxtaposes against his rather sad and weary eyes, which are simultaneously absorbing and inscrutable. Although Dano does not act in this film, his eyes behind the camera present this story in a similarly understated yet spellbinding fashion. The story follows 14-year-old Joe Brinson (Ed Oxenbould), the son of Jerry (Jake Gyllenhaal) and Jeannette (Carey Mulligan) Brinson, as his parents’ marriage falls apart against the backdrop of a looming wildfire in the mountains. The film is shot through his eyes and his experience and is fundamentally a coming-of-age story. I know little and care less about Dano’s private life, but “Wildlife,” despite being adapted from Richard Ford’s 1990 novel of the same name, feels extremely personal; even Oxenbould’s resemblance to Dano with his babyish face but mature eyes may not be a coincidence. But perhaps everyone would find this movie personal and deeply affecting, provided that they have experienced family problems at some point in their lives. “Wildlife” is undoubtedly a melodrama, which as a genre has always been concerned with the family. Melodrama, by definition, combines music and drama to create an emotionally heightened experience. Contemporary audiences may find old Hollywood melodramas cheesy and unforgivably overdramatic. 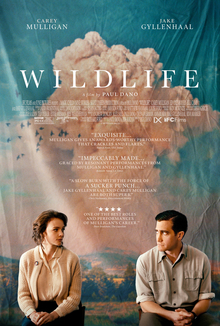 However, unlike these studio films, “Wildlife” is anchored by an understated and naturalistic atmosphere that matches the subtle performances of its director. The score is ambient and minimalistic. Gyllenhaal and Mulligan give nuanced performances that feel authentic to the film’s setting. This period piece may even be a much better representation of the outwardly picturesque and materialistic American family bubbling with anxiety and discontent underneath than the movies made during its time period. But most importantly, the film is a slow-burning drama that earns its emotional climax with its assured direction. Dano employs plenty of static and painterly shots that linger after the actor leaves the frame, creating a sense of emptiness. The mostly unmoving camera and tightly composed frames are reminiscent of still photography, a motif that gains thematic significance and emotional impact over time. Dano also never loses sight of its main subject, Joe. Recurrent point-of-view shots encourage the audience to identify with Joe as we witness his parents’ marriage go up in flames through Joe’s eyes. But all wildfires pave the way for new life, and identifying with Joe and his development may provide insight on what exactly can rise from the ashes. Though Joe is the main character of the story, Jeannette and Jerry play essential roles as the compelling and active subjects of Joe’s passive gaze and as the catalyst for change. Mulligan steals the show in a career-high performance as a discontented yet ambitious mother. Gyllenhaal also offers a heartbreakingly implosive performance as a prideful but guilt-ridden father. To describe how Jeannette and Jerry drift apart would be to spoil the movie, but both of these characters make decisions that may be frustrating yet are completely understandable. In what could have been a very wordy film, Mulligan and Gyllenhaal express themselves through minute body language and actions, which never feel out of place or ostentatious. As a result, though you may not sympathize with either of their flawed characters, Dano makes sure that you empathize with them. The slow pace and picturesque compositions create a dreamlike atmosphere in which time seems to stands still, as if the film were a photo capturing a single moment in time. Early on in the film, Joe takes up a part time job as a portrait/family photographer at a local photo booth. His boss tells him that people take these pictures to capture happy moments and preserve them forever. He reminds Joe to always ask the subjects to smile. “Wildlife” does the complete opposite. Dano captures a devastating and tragic moment in an adolescent’s life that no one would want to preserve, let alone project onto the big screen. But it is this very confrontational nature of the film that allows one to explore and come to terms with the pain of losing one’s innocence and transitioning to adulthood. It’s not a very uplifting film, but it will undoubtedly affect you in a way few movies can. Its emotional impact builds and builds in a way that you can’t detect at first, until it culminates in a final image you will never forget. Shane Jung '22 is planning on majoring in film studies and minoring in math or philosophy. He writes biweekly movie reviews in the Arts section.